As Bluetooth communications work their way into our daily lives, it’s only natural that they’d begin to become essential to our motorcycling tool kit. Up until I received the Cardo Scala Rider Q3 Multiset, I’d successfully avoided any type of communication system as part of my riding arsenal. However, a ton has changed in the last few years. Most importantly, the use of GPS turn-by-turn directions has become so common that even map lovers, like myself, have accepted that we no longer need to tape maps/directions to the bike’s tank. The left button controls the intercom. The ridge in the middle houses an LED status light. The right button controls the phone and other audio sources. The Cardo Scala Rider Q3 Multiset comes in an impressive, zippered, molded plastic case. Upon opening you’re faced with the pair of stylish Scala Rider Q3 control units, which arrive pre-paired for plug-and-play use. Lifting out the tray containing the modules reveals a variety of mounting options. 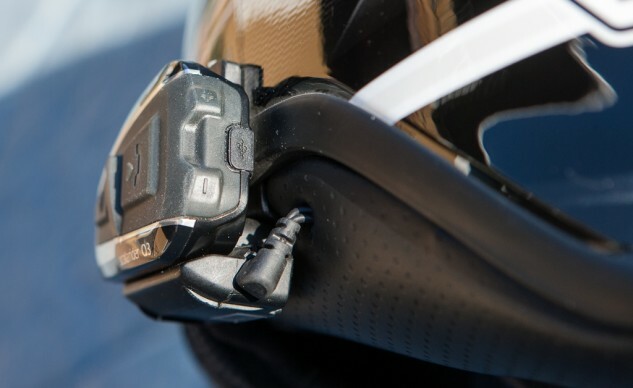 While the recommended method for attaching the Q3 is a screw-on clamp that grips the inside and the outside of the helmet, two stick-on plate options are also included for use with helmets that the clamp mount doesn’t fit. Once the mounting plate is attached to the helmet, the Scala Rider Q3 slides and clicks into place. The audio kit has two options for microphones. Riders with open face or modular helmets use an adjustable boom mic. 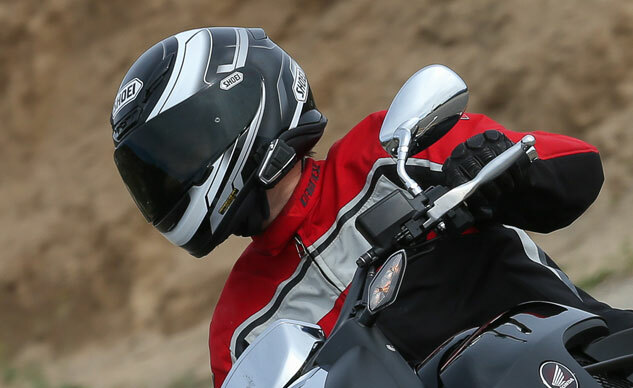 For those with full-face helmets, the corded version gives maximum flexibility. Switching the mics requires partial disassembly of the audio kit, but this is a worthwhile effort since it assures a solid connection between the microphone and the unit. Unless you’re switching the base to another helmet, you’ll only need to do this once. The detent between the + and – buttons makes adjusting the volume easy – even with gloves on. Placing the internal speakers and the corded mic was much easier with the cheek pads of the helmet removed. The wires could be run, and the excess tucked away before the pads were returned to place. I also used a little tape to cover the mic cord between the mic itself and the edge of the cheek pad. The included speakers are nice and small. Although my Shoei RF–1200 had speaker cutouts in the liner, the thinness of the Cardo speakers leads me to believe that they would be okay in helmets without cutouts. The speakers fit nicely inside a Shoei RF–1200’s cutouts. A pair of spacers can move the speakers closer to the rider’s ears, if necessary. Charging the control module is done via a micro USB cable that you probably already have. The Multiset comes with two cables and two chargers. 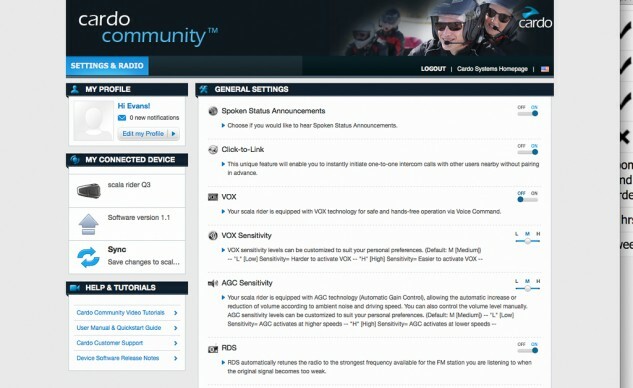 Before using the unit for the first time, you should connect the unit to your Mac or PC and make sure you have the latest firmware, which requires registration on the Cardo Community website. Installing an update is a button click away. 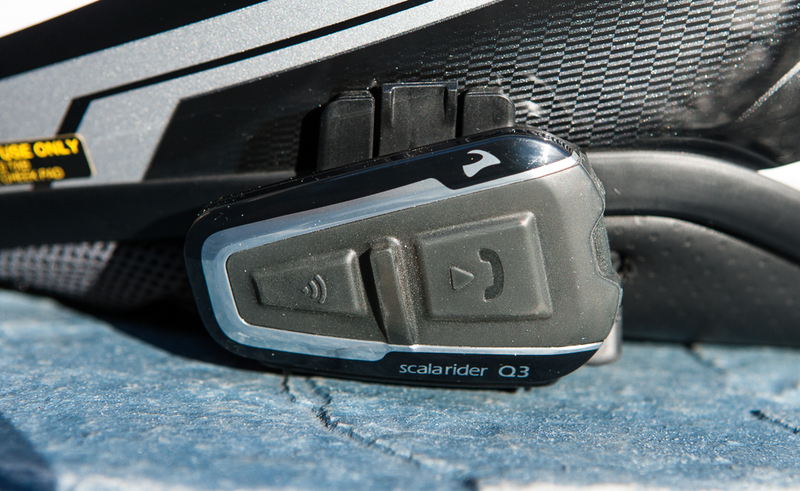 Although the Scala Rider Q3 is waterproof, make sure the rubber USB port cover is securely in place before wet rides. 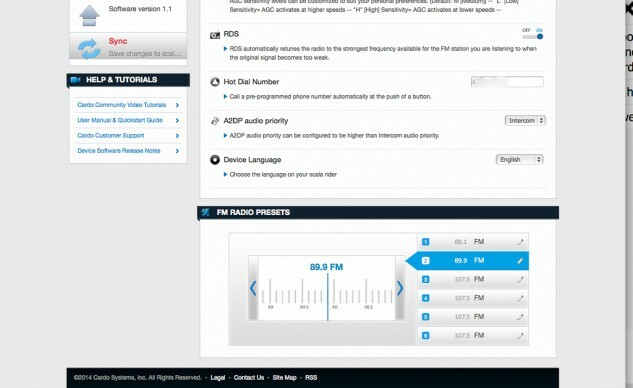 I found the automatic gain control was just about perfect in its adjustment of the headset volume based on wind noise, but you also have the ability to adjust the sensitivity from the standard Medium setting to High (for activation at lower speeds) or Low (for delaying activation until higher speeds are reached). One of the nicest options was the ability to program in a hot dial number that is automatically dialed when you press the phone button three times. Pairing the Q3 with my iPhone took about a minute. Not only could I listen to directions, music and phone calls on the road, but also voice dialing via Siri was available via a button combination (the same is true for Android phones). People on the phone were shocked to find that I was calling them from a headset in my helmet at Interstate speeds. Some insisted that I had to be in a car and not on a bike. My voice was that clear. My experience with the intercom was similar. Be forewarned, you should never give Karaoke Editor, John Burns an intercom. Although he’d told me before that he often sings while he rides, nothing could have prepared me for the shock of having him serenade me on a spirited ride out of the mountains after a photo shoot. Singing, humming, a constant monologue – the music sharing feature of the Q3 Multiset isn’t needed when you’ve got a riding partner like this! 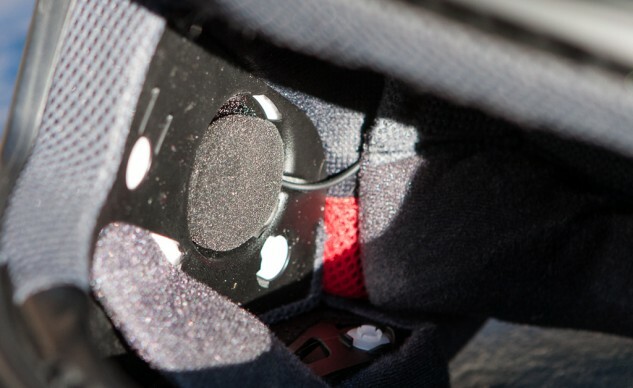 The two microphone options will cover installation in all full-face, open-face and modular helmets. 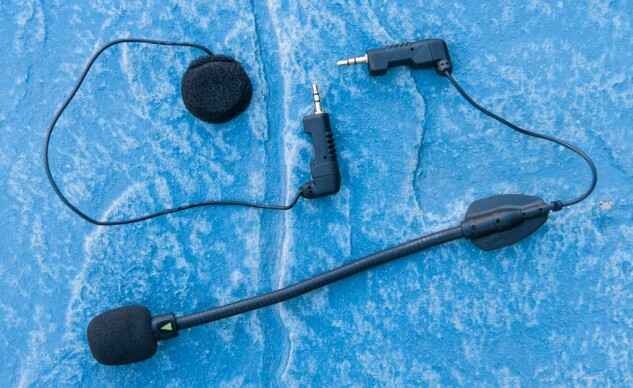 Since Burns mounted the other half of this pair of Q3s in a modular helmet, it revealed that the boom microphone was susceptible to placement. If it was right in front of his mouth, I could clearly discern his ramblings. When he bent it down away from his mouth more towards the edge of the chin bar, I was treated to the sound of the wind flowing past his helmet. The range between the Q3s was dependent on the riding environment. In the wide open of the interstate, distances of up to a half mile are possible. In the mountains, the range is considerably less, as the topography can block the signal. Although I never tried talking for the claimed eight hours of battery power, I did get two full days of riding with intermittent music and GPS use on a single charge. The 1/8-in. jack allows for the use of your favorite noise isolating headphones with the Q3. The audio quality of the included speakers was good for around town riding. However, out on the highway, particularly on bikes that sent dirty, turbulent air at the helmet, the speakers could overpower the noise, but without earplugs, I didn’t find music enjoyable, just loud. Carrying on a phone or intercom conversation was difficult in that situation. I resolved the issue somewhat by wearing earplugs. While this may sound counterintuitive, lowering the overall sound level meant that the speakers had a chance to overpower the wind noise without reaching my threshold of pain. However, there was a fine line between the volume that could be heard above the ambient noise and the point at which the speakers began to distort. I decided to try my noise-isolating headphones for highway riding. Although my in-ear headphones are now discontinued, they are the precursor to the Etymotic hf5. By combining my earplugs and speakers, I was able to damp the wind noise (by 35–42 dB) and listen to music – only now at a low volume that allowed me to appreciate the music on long rides and understand my wife on the phone. Still, for around-town, daily use, the Q3’s included speakers work just fine. And, overall, our other editors were largely happy with the performance from the standard speakers. The Cardo Community web site allows you to upgrade firmware and adjust settings to your tastes. Operating the Scala Rider Q3 is done via four buttons. Consequently, a device as flexible as this has a steep learning curve. You’ll pick up the functions you use most quite easily. It’s when you try to do something new out on the road that you’ll want to keep a copy of the quick-start guide handy. Finding and operating the buttons with gloved fingers is pretty easy. The notch on the rear edge of the module assists your finger in locating the + and – volume buttons. I wished for a more prominent bump between the intercom and phone buttons on the main face of the module, but it wasn’t a major concern. Out of the box, the pair of Q3s connected without any intervention on our part. Pairing with other units was more difficult than it should be. In fact, I wished that we could have done it online as with the Scala Rider G9, but that’s why you pay $289.95 for the privilege of owning one of them. While the Q3 is capable of pairing with four other Cardo Bluetooth units, you can only communicate with one of them at a time. In the real world, this is probably the way that most people use these communicators. However, if you’re looking to use them with your club, we’d recommend paying the extra for the G9. 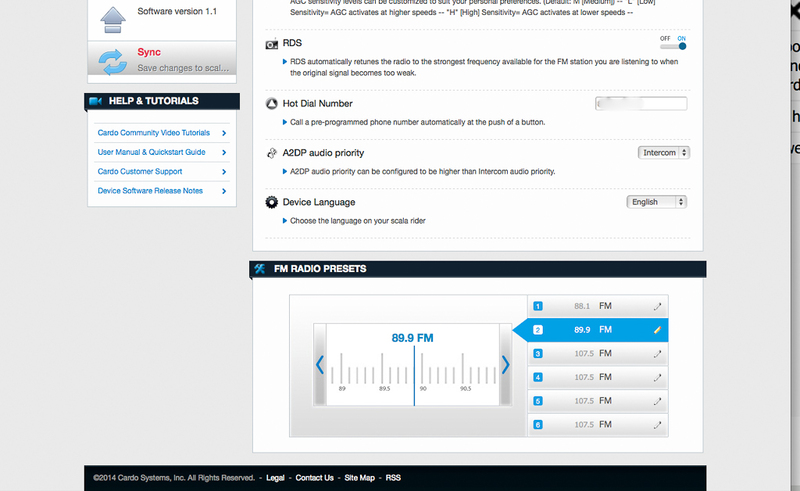 Program in your Hot Dial Number and six radio stations. Sync the changes to the Q3 and go. For couples who tour together, you no longer have to be tied to the bike via an umbilical cord. You can argue wirelessly. 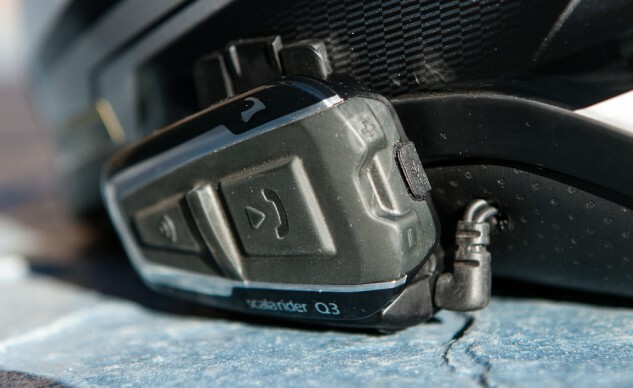 For a pair of riding buddies, the Scala Q3 Multiset is well worth the $389.95 price; bought individually, they cost $219.95. Even for those who don’t have friends they want to talk to when they ride or don’t think it is wise to be connected to a cell phone on the road (your family might call and tell you it’s time to come home), riders who use their GPS a lot or want music for long rides will still find the Q3 a useful tool. In the space of just a few weeks, the Q3 has become an indispensable part of my riding gear. 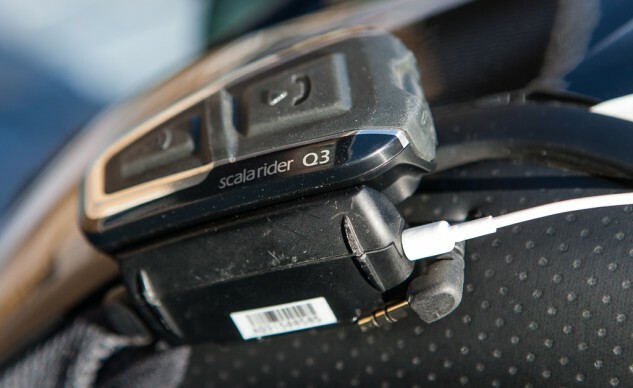 For more information or to order a Scala Rider Q3, visit the Cardo Systems website.